Massey Ferguson is unveiling a new-generation rotary combine harvester range which promises a major step forward in performance and productivity for business-orientated farmers. Among a host of exceptional new features, models in the IDEAL from Massey Ferguson line-up offer the biggest integral grain-tank capacity now available on the European market, the fastest unloading rate and the largest threshing area – all focussed on delivering significant gains in efficiency and output. Three brand-new combine models, featuring single and dual rotary threshing systems – the 451hp MF IDEAL 7, 538hp MF IDEAL 8 and 647hp MF IDEAL 9 - plus ParaLevel versions. 4.84m ‘Dual Helix’ rotor fitted to the MF IDEAL 8 and MF IDEAL 9 is the longest in the industry. It provides the largest threshing area in the business (31%* more square metre area than the nearest competitor), while benefiting from very low power requirements and insensitivity to varying crop conditions - for fuel efficiency, low grain losses and gentle handling of grain and straw. 12,500 and 17,100 litre grain tanks: 17,100 litre option is the largest currently available with approximately 18%* more capacity than the largest available today - reduces the frequency of unloading for improved efficiency. 140 and 210 l/sec unloading rates: ‘Streamer 210’ option at 210 l/sec is the fastest available – approximately 32%* quicker than today’s highest rate - for boosted in-field and logistics productivity. Grain quality benefits from the MF IDEAL’s low compression and extra-long rotors, which are gentle on straw, thus avoiding contamination of the sample. With the IDEALbalance under-rotor pans making pre-separation longer, they ease the job of the sieve box and fan to create a clean grain sample at high output. In addition, within the tank and unloader system, despite having the fastest unloading auger in the business, the flight pitch is designed to minimise damage to grain while optimising flow. All these features come together to make the final product as clean and as high quality as possible leading to less grain processing and helping to achieve better prices. One of the key aspects in the design of the IDEAL Combine is that it should be easy to use. A good demonstration of this is the IDEALharvest self-adjusting function option. 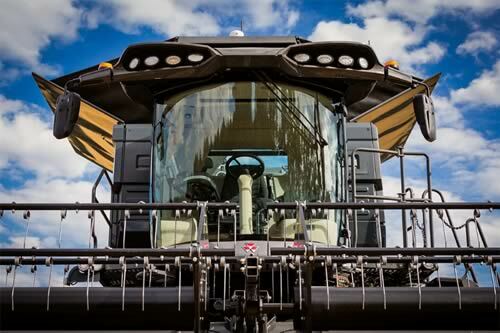 Using 52 MADS sensors around the combine a very simple dashboard can be brought up on the Tech Touch Terminal or the SmartConnect™ App on a smart device which allows the operator to choose a combination of quality, performance and sample cleanliness for his harvest. The machine itself will then fine-tune the rotor speed, fan speed and sieve opening to create the ideal settings for his choice of parameters. Uniquely, this function can provide a visualisation on the terminal or the App of the crop flow within the machine so the operator can see for himself the distribution of crop inside the combine. For operation on slopes, the IDEAL Combines are fitted with the unique IDEALbalance system. The combination of the two shaped under-rotor pans is insensitive to slopes up to 15% and places the grain mix in exactly the right position for the separation pan, sieve box and fan to produce a clean sample at high output. For those on steeper terrain, a ParaLevel version of each combine model can compensate further on slopes up to 15%. These models are equipped with the Streamer 140 unloader at 140 l/s and a 12,500 litre grain tank. The renowned ParaLevel system moves the front axles naturally and smoothly, following the ground contours and keeping the major components level. In terms of residue management, IDEAL from Massey Ferguson Combine makes it easy to incorporate chopped straw as the material is able to be spread more evenly over a wider area. This is thanks to the fact that distribution of material from the ShortCut chopper can match the full width of the header up to 12m using the unique, low power requirement ActiveSpread feature. For Data Management, the IDEAL from Massey Ferguson Series boasts straightforward access to data and high connectivity via Bluetooth wireless technology and the AgCommand telemetry-based machine management tool. In a seamless transfer, both performance and harvest data can be fed back to the farm office, MF Dealer or the manufacturer for analysis and optimisation of operations. All levels of MF Auto-Guide™ steering technology are available and easily managed from the new Vision cab controls. Soil compaction from in-field traffic is reduced as a result of the IDEAL from Massey Ferguson's large grain-tank and super-fast 210 l/sec unloading rate option which decrease unloading cycles. Smart grain-gate operation automatically allows easy start-up for the unloader system but can also be manually controlled to give a variable rate for topping-off trailers. A completely new suspended track system called TrakRide has been designed by AGCO’s track competence centre. TrakRide is available with varying widths to suit different operations and conditions, offering maximum comfort for the operator and making a significant contribution to minimising soil compaction. The MF armrest in the brand-new Vision cab will be familiar but closer inspection reveals that much has changed in the operator’s area. New additions which make it even more comfortable for the driver include a new ventilated seat, a fridge unit, extra storage, new information dashboard and the ability to move the Tech Touch terminal 90 degrees to the operator’s right which further enhances visibility of the table. Many of the operator tasks now have short cuts to make the machine easier to operate. LED lights and a camera package improve night visibility for long hours’ working. In a further feature for ease of operation, the unique new AutoDock™ table hook-up option saves time, promotes safety and minimises effort for the operator. When hooking-up the header from a table trailer or from the ground, the operator simply presses a button in the cab and all the connections - mechanical, electrical and hydraulic - are made automatically by a robotised process. The operator remains in the clean, safe cab and is ready to go. A fundamental part of the project was a series of in-depth, one-to-one ‘Voice of the Customer’ interviews on-site with 60 combine owners and operators in 12 countries. In Europe this included France, Germany, UK and Poland. This was followed by a mass customer survey eliciting over 500 responses. From here, a list of critical areas for action was developed. While customer priorities varied depending on their region and market segment, the main messages stayed the same. Key feedback from the field highlighted the need for reliability, ease of repair/parts availability, intuitive and convenient controls, efficiency and the ability of the machine to fit the customer’s operational profile. The IDEAL from Massey Ferguson Combines are built at the AGCO Breganze manufacturing site in northern Italy. The 25 ha site has been the subject of major investment over recent years. Certified to ISO standards, some of the latest developments at the 65,000 m2 plant have seen a complete reorganisation of the supply chain and production process, the installation of new rolling and panelling machines, robot welding automated systems, a state-of-the art paint-shop and the opening of the magnificent AgriDome Visitors Centre.